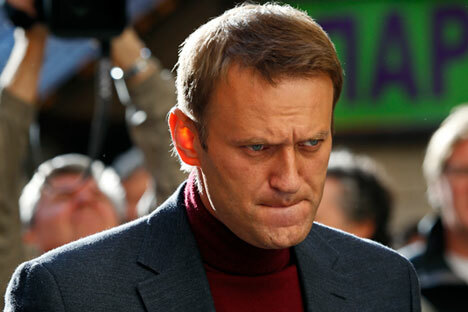 Russian opposition figure Alexei Navalny. Opposition activist Alexei Navalny's Anticorruption Foundation has published the results of an investigation accusing the family of the Russian prosecutor general of allegedly having an illegal business empire and close links with the criminal world. Prosecutor General Yury Chaika has already dismissed these reports as “a hatchet job” and lies. The subjects of the investigation are now preparing lawsuits. The Anticorruption Foundation (FBK) led by Russia’s opposition figurehead Alexei Navalny has released the results of an investigation into the possible involvement of the family of Prosecutor General Yury Chaika in major corruption crimes, as well as links with the underworld. The authors of the investigation, which was published on the internet on Dec. 1, revealed details of the foreign assets allegedly owned by the prosecutor general's family, as well as illegal businesses in Greece and in the regions of Russia, real estate in Switzerland worth about $3 million, the illegal seizure of a state-owned enterprise and a murder. The main individual accused in the FBK investigation was the prosecutor general's eldest son, Artyom Chaika. According to the foundation, he allegedly collaborated with the former wife of the deputy prosecutor general, Olga Lopatina, who had a joint business with the spouses of the leaders of the Kushchevskaya group, a criminal gang responsible for the murder of 12 people (including four children) in a village in the Krasnodar Territory over a period of 16 years. The authors of the investigation say this information is confirmed by "all possible extracts" and databases (screenshots from a company database and photos of extracts and statements are attached to the report). The investigation took a year and a half to complete. By Dec. 3, a 40-minute film, which the FBK had shot based on the results of the investigation, had scored more than one million views on YouTube. Presidential press secretary Dmitry Peskov denied that the Kremlin had looked at the results of the investigation. "We did not have time, the priority for us is still the theme of preparing the president for the federal message [the President's address to the Federal Assembly took place on Dec. 3]," said Peskov. At the same time, Yury Chaika has already called the investigation a "hatchet job" and lies. "For me, it is obvious that this is a hatchet job that was evidently carried out not at the expense of those who prepared it. Big money!" said Chaika, who promised to name his solicitor soon. "The data presented is of deliberately deceitful character and completely groundless. It is absolutely clear to me who and what is behind it." Lopatina also denied any connection with the Kushchevskaya criminal group, passing her statement through a representative of the prosecutor general's office. According to her, the presented extracts from the registration documents cause "bewilderment." Lopatina is now preparing a lawsuit to protect her honor, dignity and business reputation. "As far as I know, the lawyers of A. Yu. Chaika [the prosecutor general's son] are also studying the possibility of going to court," she wrote.